The job openings rate was little changed in September at an enemic rate of 1.9 percent. The number of job openings has fallen by 2.3 million, or 48 percent, since the most recent peak in June 2007. These data are from the Bureau of Labor Statistics’ Job Openings and Labor Turnover Survey and are seasonally adjusted. 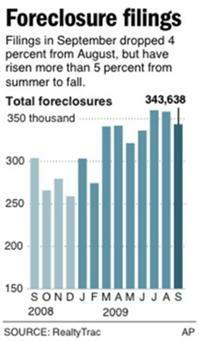 Data for the most recent month are preliminary and subject to revision. 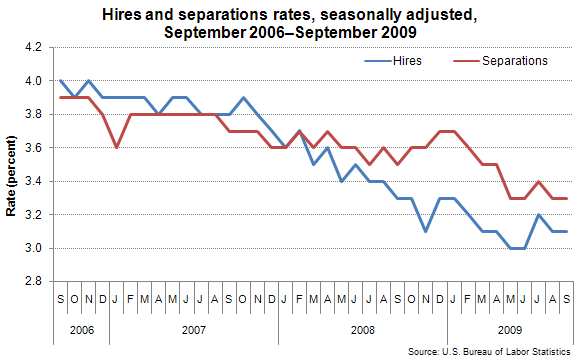 Find additional information in “ Job Openings and Labor Turnover—September 2009”. Hires are the total number of additions to the payroll occurring at any time during the reference month. Separations are the total number of terminations of employment occurring at any time during the reference month, and are reported by type of separation—quits, layoffs and discharges, and other separations.